Soil – particular heavy, clay-based soil – has a tendency to become compacted over time. The soil particles get pushed closer together by heavy rainfall and/or foot traffic on the surface, and this makes it difficult for moisture and essential gases to flow freely and reach the roots of your grass. This can lead to poorly-developed roots, weak grass, and poor disease / drought tolerance. If your lawn has become unsightly as a result of soil compaction, our expert lawn aeration and spiking service can help. Call 0800 111 4958 today to arrange a FREE soil aeration survey. Compacted ground can have serious consequences for your lawn, but this problem can be easily solved by aerating the soil. We offer this service in Cardiff, Swansea, and most other locations throughout South Wales. Lawn & Weed Expert use professional aerating machines that move across the surface of the lawn and punch metal spikes (tines) 2-3 inches into the ground, creating hundreds of small holes in the lawn. If necessary, hollow tines can be used to pull a soil core out of the ground – this helps to remove troublesome thatch as well as aerating the lawn. Lawns should be regularly aerated to enable grass roots to develop healthily. 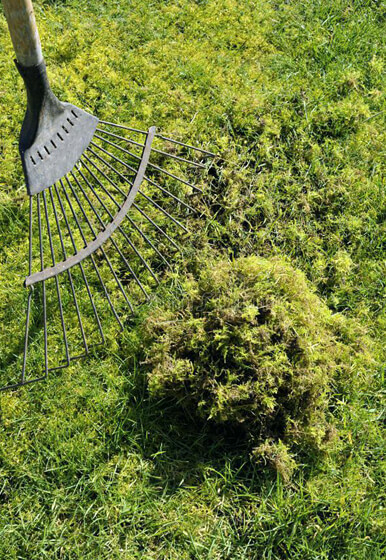 The RHS recommend spiking your lawn every 2-3 years and carrying out hollow tine aeration every 3-4 years. Waterlogged lawn? Lawn aeration may be the answer! Compaction caused by heavy footfall and/or rainfall can create slow-draining areas that hold water and form puddles. Look for a sticky covering of paste-like soil on the surface of your lawn – if you see this, you may have a waterlogging problem. Relief can be achieved by penetrating the soil to a depth of 4 inches, then filling the holes with sandy top dressing to act as miniature ventilation shafts, improving the flow of air and water to the grass’s roots. This kind of work should be carried out in the autumn, with a potassium-rich feed used to assist root development. To find out more about our grass aeration service, or to request a FREE lawn survey, please contact Lawn & Weed Expert today!